In twenty years’ time, we will look back on Brexit as a moment of terrifying global irresponsibility. We live in a world of creeping fascism in Russia, Turkey, China, Trump’s America not to mention the tendencies inside Britain, especially among the hard Brexiteers. The European Union currently represents a beacon for democracy and human rights. Of course, it is dominated by a neo-liberal ideology that threatens to undermine the eurozone and with it the democratic values for which it stands; developments in Central Europe and the recent elections in Italy are a painful reminder of the dangerous possibilities. Nevertheless, there are tendencies for reform inside the European Union and if a Corbyn-led Labour Party were to win the next election, there is a unique – indeed a once in a lifetime opportunity – to reform the European Union and this means an opportunity to save us, Europe and perhaps the world. Note: This article gives the views of the author, and not the position of the Euro Crisis in the Press blog nor of the London School of Economics. It has also appeared under a different title on openDemocracy (published under a Creative Commons Attribution-NonCommercial 4.0 International licence). Mary Kaldor is a Professor of Global Governance and Director of the Conflict and Civil Society Research Unit in the LSE Department of International Development. This entry was posted in Brexit, United Kingdom and tagged Brexit, Corbyn, Labour, Socialism. Bookmark the permalink. 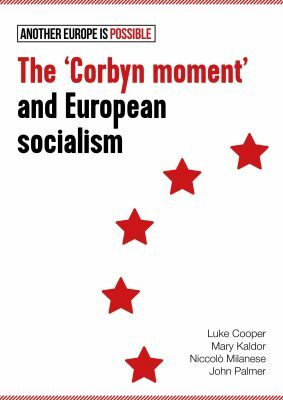 2 Responses to Remain to Reform: The ‘Corbyn Moment’ for Europe? “The European Union currently represents a beacon for democracy and human rights.” Really!!!!! The EU is simply reaping the rewards of years of corrupt anti-democratic power grabbing. The growth of popular parties in all EU nations and Brexit and the recent Italian election results in particular are a reaction to selfish norrow-minded europhiles who refuse to accept that the promises of stable growth, wealth and social cohesion will never be delivered by the overgrown beaurocratic that the EEC morphed into. Dream on luv. you are a typical lefty dreamer. Reform the EU from the inside? Don’t make me laugh.